Apartment in Villa of 19th century belonging to our family. Our grandparents used to live here and now we have divided the villa in 5 smaller apartments. We have completely renovated it for our Guests. In case guests are more than 4 and within 6 persons, you can check also the other available apartment in our Villa and enquire at vrbo 800629 for additional booking. The historical center is at 10 minutes walk and more precisely at 1 km distance. 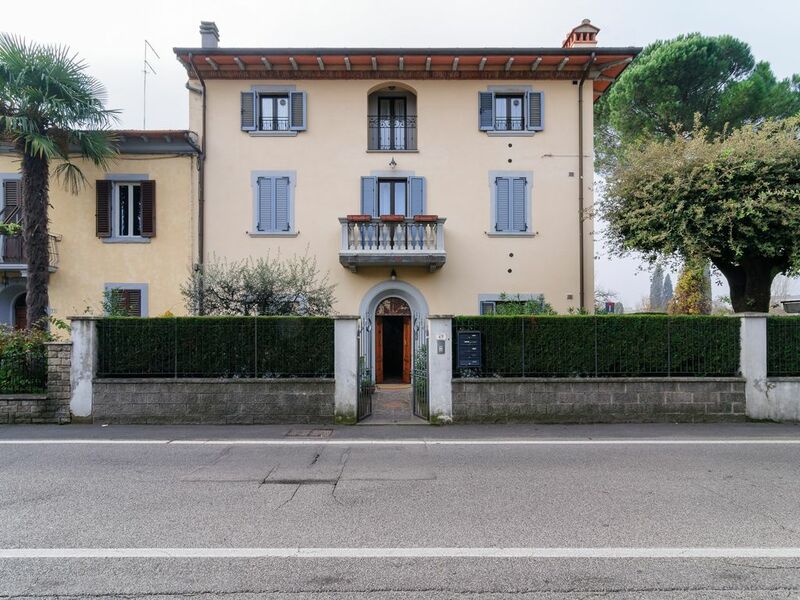 It is Located in a comfortable road for driving and parking, at just 200 meters from the famous church of Santa Maria delle Grazie, one of the many heritage art pieces of the city. A location which allows our guests to be very close to the historical center and at the same time to be free to leave quickly Arezzo for the daily car excursions in the other touristic cities close to Arezzo and South of Tuscany like Cortona, Volterra, and other smaller villages of etruscan heritage. We are proud to offer our guests a very comfortable and cozy apartment composed by one main bedroom with Kingsize bed and finest satin cotton sheets and pillows bags. This bedroom is about 15 sqmts with an en-suite changing room and closet. Another smaller bedroom with two real and comfortable twin single beds.This bedroom is about 10 sqmts. Separately from the two bedroom there is a comfortable and completely renovated bathroom with a new washing machine. Our bathrooms are all furnished with design accessories which make them very functional and beautiful at the same time. We offer a courtesy kit of shower gel and shower cap. After a day of work or pleasure in Arezzo You can relax in our spacious living room where You can eat comfortably if you feel to cook. The apartment is on a first floor. Guests arriving at our apartment will be greeted by us and we will introduce how the apartment works before leaving the keys. Anti allergenic mattresses and ergonomic cushions both in memory foam. We are a couple in life and for work. We love hospitality and share what Florence, Arezzo and Tuscany have to offer in terms of beauty and life pleasures. We normally work at our own collection of handicraft lifestyle products especially in the area of towels and blankets, called Aquatellus, which you can find on its Facebook page. In order to produce it we travel extensively through the Mediterranean and in particular in Anatolia. Before starting the venture of these apartments rental we have travelled around the world for work and also pleasure and in particular Asia, North America and a good part of Western Europe. We have learn a lot from the others watching what they were preparing for us and we have tried to transfer what these clever people in the hospitality world are normally offering to their customers/friends to make them feel at home. Anyway it is our aim not to stop here as we will try to give more and more to our guests. We really hope that at the end of your stay, you will become also our international friends. Welcome to our beloved apartments. Siamo una coppia nella vita e nel lavoro. Amiamo l'ospitalità e condividere ciò che di bello Firenze, Arezzo e la Toscana hanno da offrire. Lavoriamo ad una collezione di prodotti artigianali per lifestyle che si chiama Aquatellus e per produrla andiamo a cercare artigiani in tutti i villaggi del bacino mediterraneo e in particolare in Turchia. Prima di cominciare con questo appartamento abbiamo girato il mondo per lavoro e per piacere in Asia e in America e Canada oltre a buona parte dell'Europa. Abbiamo imparato tanto dagli altri e cercato di prendere le cose buone di chi è bravo nel mondo dell'accoglienza. Comunque non ci fermeremo certo qui e vogliamo dare sempre il meglio e sempre di più ai nostri ospiti. Che speriamo diventeranno anche i nostri amici. Benvenuti ai nostri appartamenti. We provide fast and reliable connection through Fastweb. It is wifi of high speed. The fastest company in Italy. Very nice accommodation. Very clean, comfortable and well appointed. The location has easy access to the town center-about 15 minute walk and to the Esselunga supermarket. The kitchen has everything to cook nice meals. We spent a little over a week and day tripped to other Tuscan towns using this as our hub. Would rent this again. What a beautiful apartment in Arezzo! The beds are so comfortable and the rooms beautifully appointed. A great kitchen space and washer add just the touch for travelers needing the comforts of home. Vera is a sweetheart - and she and I were able to communicate with hand gestures and lots of "buenos"! Alessandro was great at responding to my questions or concerns. The apartment is a bit out of the way - the only downside. That being said, it is quiet for sleeping! Graci, Alessandro and Vera!! Thanks a lot Melissa. can you ask your friends to leave a review for the other apartment? This was a wonderful home for us for 4 days. It was a beautiful large apartment, roomy for 4 persons but spacious for the two of us. The kitchen was equipped with everything that we needed to enjoy meals at home but a great meal was within a short walking distance (our favorites were Al Sapori, a great Tavola calda just a few blocks away, and Vigna, just across from the train station). I loved the washing machine which did a load of laundry in record time. Every morning we would take advantage of the views by having coffee on either the front or back balcony. We had a car so it was easy to access the Esselunga super Marche for all of our grocery needs. We look forward to returning again soon. Good wifi reception too. We enjoyed the apartment and the hospitality of Alessandro and Vera. Nice location and well appointed.